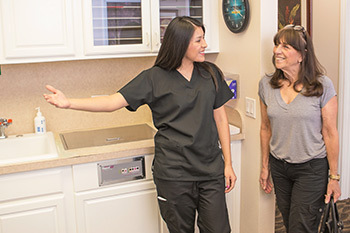 First Visit & New Patient Exam | Orange County Periodontists | Ajay B. Setya, DDS, MSD Robert C. Hirst, DDS, MS Christen S. Bergman, DDS., MS.
You will get a friendly greeting and be well cared for on your first visit. Dr. Setya, Dr. Hirst, Dr. Bergman and all the staff are dedicated to providing you the highest quality treatment in a friendly and caring environment. We make sure this occurs from the moment you first contact us. Our doctors and staff are very welcoming, will take care of your every need and make you feel at home. Dr. Setya, Dr. Hirst, or Dr. Bergman will listen to your concerns and do a very thorough exam to determine what treatments are best for you. Dr. Setya, Dr. Hirst, and Dr. Bergman are interested in both your immediate concerns and what will be in your best interest for long-term health. 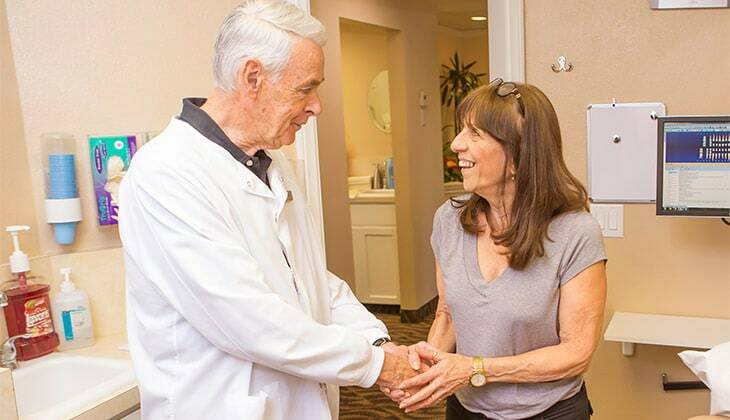 Their goal is to help you keep your teeth or dental implants for a lifetime. We will give you a tour of the office on your first visit. When you first come into the office, one of our friendly staff will help you complete any needed paperwork and answer any of your questions. We will give you a complete tour of our office so you can see what we do and are comfortable. We will then take you to your treatment room for the start of your examination. We use the latest in advanced technology to get a comprehensive view of your oral health and make an accurate diagnosis. 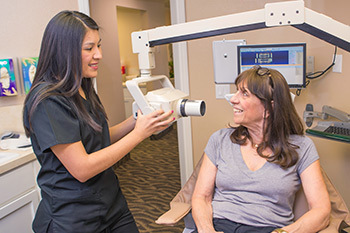 We start by taking a full set of digital photographs of your teeth and bite. We will also take pictures of your smile and profile as needed. Digital photos give a clear view of the state of your teeth and gums and show things that are not visible on X‑rays. Digital X-rays are taken during your exam. We take a full set of digital X‑rays of your entire mouth where current X‑rays are not already available. Our digital X‑ray machines emit 80% less radiation than standard film X‑ray devices. The images are available for viewing in seconds and are often much clearer than standard film X‑rays. We use 3D CT scans for precise diagnostics and treatment planning. 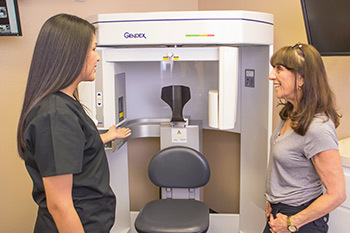 When needed, we will use our cone beam 3D CT scanner to get a complete picture of your jaw, gums, teeth and head. The images are computer-processed into 3D views of your teeth and jawbone that can be viewed from any angle. Using the 3D images we can precisely plan bone grafting and dental implants procedures. 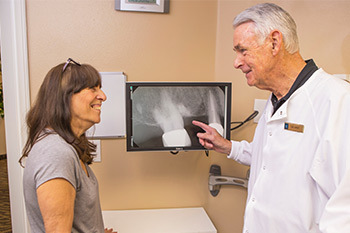 Before your physical exam starts, the doctor will review your medical and dental history and inspect the photos and X-ray images that have been taken. He will also review your goals and concerns with you and will answer any questions. Our exams are very thorough and informative. The doctor will do a thorough inspection of your gums, teeth and bite. He will gently probe the depth of the pockets under your gum line and assess the degree of any gum disease. He will check the stability of your teeth to see which ones may be loose, and will check the alignment of your bite. He will also check the amount of gum tissue surrounding your teeth and will note any gum recession or other issues. 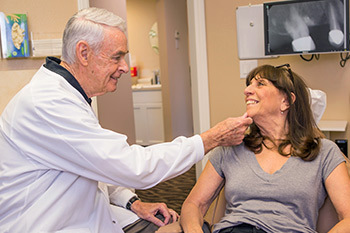 During your exam, Dr. Setya, Dr. Hirst, or Dr. Bergman will conduct a thorough inspection of your head, neck and mouth to check for any abnormalities that could be evidence of disease, including oral cancer. When indicated, the doctor will use the Identafi® oral cancer screening device to obtain more detailed information. The doctor will fully explain your treatment options and answer any questions. Dr. Setya, Dr. Hirst, or Dr. Bergman will thoroughly explain to you what was discovered in their examination, and will show you your X-rays and pictures so you understand thoroughly what is happening. They will then explain your treatment options in detail and answer any of your questions. You will receive a full written treatment plan at the end of your consultation so you can easily work out scheduling your treatment.